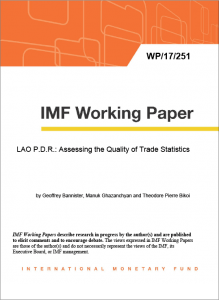 This document, produced by the IMF, accounts for trade information concerning Laos and its main trading partners: Thailand, China and Vietnam. The document warns about the uncertainty of trade data collection due to difficulty of compiling disseminated information. This translates into a high estimation of underreported goods, both exported and imported. There exist significant data variations between both Laotian agencies and international agencies. This phenomena, which occurs systematically amongst LIDCs (low-income developing countries), despite an increasingly interconnected world economy and therefore a supposedly higher transparency, has repercussions such as a biased estimation of Laos’ trade deficit; which could in turn prove significantly higher.